Vogelbach suffered the injury when he was hit by a pitch on Friday. He underwent a MRI on Saturday, which revealed no breaks. 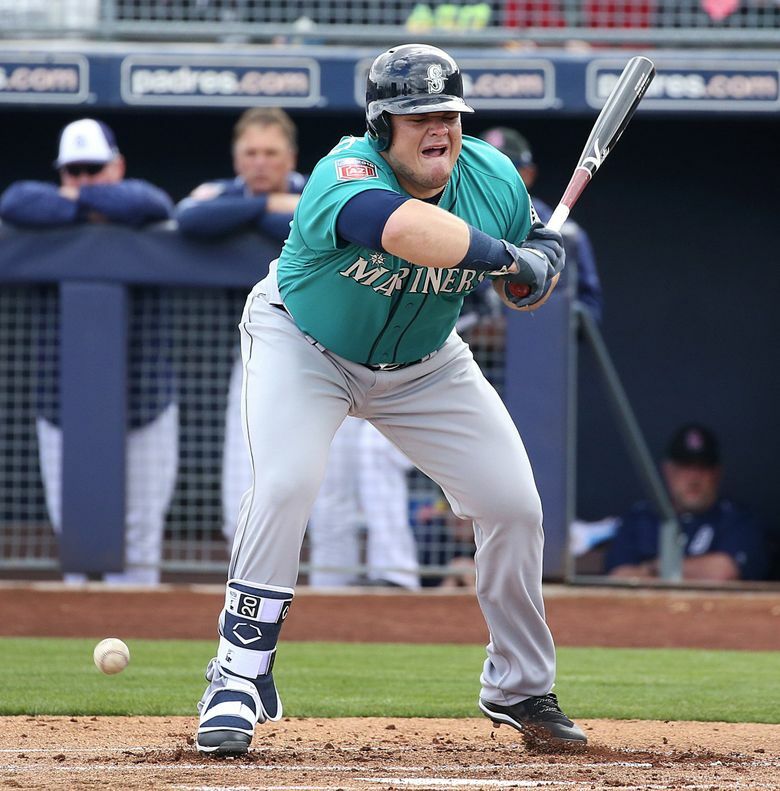 PEORIA, Ariz. — The Mariners received some good news on the health status of Daniel Vogelbach. A MRI showed that there were no breaks in his injured right foot. It’s been diagnosed as a severe contusion. Vogelbach suffered the injury in the Cactus League opener on Friday when he was hit by a pitch from Brett Kennedy in the first inning. He continued to play in the game and even hit a double in the sixth inning. 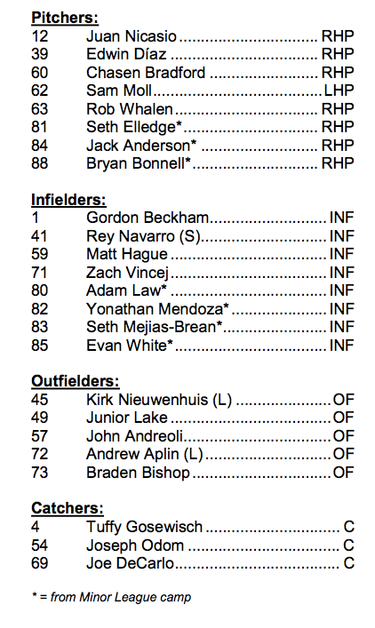 With Vogelbach sidelined from action the next few days and Ryon Healy already recovering from the hand surgery, it leaves Mike Ford as the only true first baseman on the 40-man roster that’s healthy in camp. Matt Hague, who was invited on minor league contract, is also a first baseman and we’ll get some reps.
“We were joking that I should change lockers,” Ford said, acknowledging his spot in between Healy and Vogelbach in the clubhouse. The injury attrition is a benefit for Ford, who will get plenty of at-bats to showcase himself. Selected in the Rule 5 draft from the Yankees, he has a chance to be on the opening day roster if Healy isn’t ready to go. For people that love prospects, the injuries to Healy and Vogelbach also gives last year’s first-round draft pick and No. 2 overall prospect Evan White to play in Cactus League games. He made his debut in Saturday’s 5-3 loss and will play again on Sunday. White went 0-for-2 at the plate, but he made a brilliant pick on a shorthop throw while doing the splits in a stretch. He came in with the reputation of being brilliant defensive first baseman and that was a prime example. *** For the first time since both have been to the big leagues, Kyle Seager and Corey Seager will play against each other in a game. 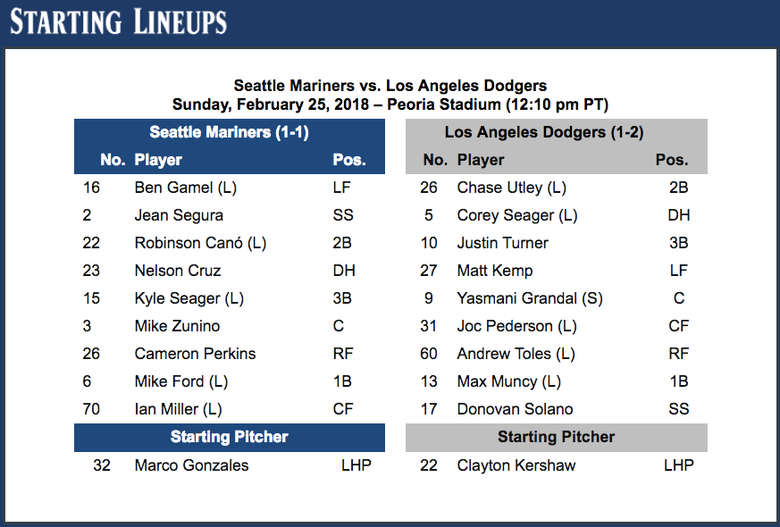 The past few years in the Cactus League when the Mariners and Dodgers would face each other, one of the Seager brothers was absent from the lineup. Corey Seager is at DH and will be second for Los Angeles, while Kyle Seager will see his first Cactus League action this spring at his customary spot at third base and batting fifth. The Mariners will face the Dodgers in interleague play this season at Safeco Field on August 17-19. *** Right-hander Nick Rumbelow exited Saturday’s game with a cut on his thumb, but it won’t cause him to miss any time.